The combined efforts of Ealing Council, persistant complaints from residents and badgering by Angie Bray MP have brought a fantastic result as the railway bridge over the Vale is finally looking smart. Work is underway to make the bridge, which welcomes a large proportion of visitors and residents to Acton as they travel West along the Uxbridge Road, vandal-proof after residents called for action at the trouble spot. 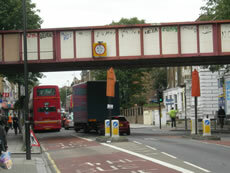 Acton Vale Bridge, which is owned by Network Rail, was repeatedly vandalised and sprayed with graffiti, blighting the entrance to the town. Now Ealing Council has stepped in, with Network Rail facilitating access, to clean-up the bridge and introduce measures to deter vandals. The operation will include jet washing the bridge, covering it with new anti-climb paint and installing security spikes to help deter vandals. The project is being carried out as part of work to regenerate the town centre and make it more attractive to shoppers and visitors. Angie Bray, MP for Ealing Central and Acton is delighted that something is finally being done about the eyesore. "It has been a long time getting the action required to clean off the bridge and put up barriers to prevent further graffiti being put up. But I am really pleased that all those nagging phone calls have finally payed off and we have a clean bridge. Painting is due to be completed shortly. Well done to Ealing Council officers and Network Rail who have got together to get the job done ." The work is already underway and is expected to be completed at the end of June. Some traffic diversions are in place while the work is carried out.